I know some have have pictures and stuff posted on here before. I have done some searching and it does not pull up what I am looking for. I have thought about putting 29" wheels on my 1x1 and wonder what issues on fit anyone has had. Pictures and tire listings with an idea of clearance would be great! Seems like you're way back in the drop outs, too. I'd go 650b with a 1x1. Too tight of clearance IMO. 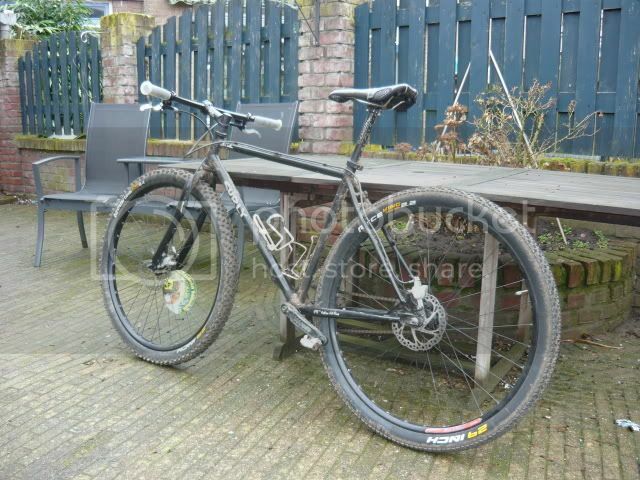 Well I have been riding a geared 29er this year for some races. 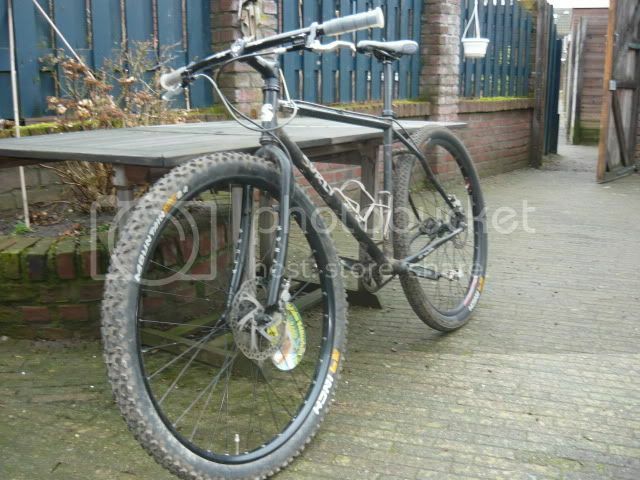 I like the bigger wheels and now want a 29er SS. I miss my 1x1 and will be able to get back on it soon as most of the races are over. I don't really have a lot of money for a new build, so I thought if I could get some wheels it would be better then nothing. Then I could work on a new frame/fork and swap my stuff over. It looks a little tight on the wheels, so I guess another option would be to go 69er until I can pick up a frame and fork. I know Surly will fit 29 too. sorry... you're giving up why? fit normal tire in the back, 2.1 nano or somesuch. don't be trying to slip in a 2.4x29 and you're fine. 2.2 nevegal fit for me, but that's about the frame's limit, fork's better. nothing that's a negative beside the higher bb. but I've got about 13" bb on my explosif with it's 2.5x26 so having the same on the 1x1 makes no difference. lots of log-avoiding space where you want it. it'll be great, do it, ignore the pundits who haven't tried it themselves. Surly already makes a KM for 29" crowds. gatman, sell me that 1x1 so I can 650b that sucker! 29x2.2 rear, 26x3.0 front= 12.5" bb height. give or take a titch. Works great with 2.2 front and rear. Might have rub with a blockier tire or anything wider.